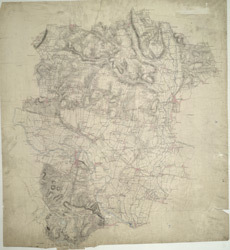 This plan of the Chiltern Hills runs from Beaconsfield and Harefield at the top to Windsor Park, Egham and Staines at the bottom. A section of the Grand Junction Canal, running from Harefield down to West Drayton, is shown in aquamarine. The paper carries the watermark "E & P", standing for Edmeads and Pine.